'Memory is a subtle and effective way of defeating the supposed inexorability of time, and this volume shows how it can be done. 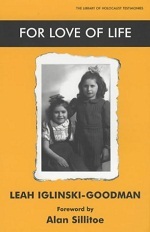 During the Nazi occupation of Belgium in 1942, two sisters -Leah, aged three, and her older sister, Sylvia, aged seven - were hidden in a convent cellar. Their mother reassured Sylvia that, at the end of the war, they would all be reunited. Sylvia was instructed to keep alive for both of the girls the spirit of what had been their joyful extended family life, and their Jewish backgrounds. For three years, the sisters stayed together in the cellar. Leah, the child through whose eyes this story is told, describes their constant struggle against fear and the shock of their 'abandonment'. Yet, this also contrasted with the astonishing resilience, courage, and playfulness that enabled the sisters to give one another strength and hope. However, Leah then endured a year of solitary confinement, during which she became delirious and experienced mystical revelations that gave her new reassurance. In 1946, just a few month's after liberation, Leah's father reclaimed her from the convent. He then traced Sylvia, and the two sisters were finally reunited and brought to live in London. For Love of Life is about the gift of life, and how human spirit can transcend adversity.